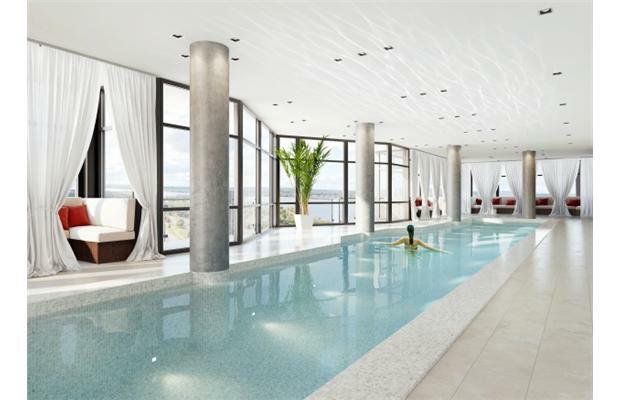 Amenities at Rhombus Tower will include a 70-foot pool with cabanas. Condo Scene: Marilyn Wilson gets a sneak peek at Tega Homes’ Rhombus Tower condo project on Parkdale Avenue. OTTAWA — I recently sat down with home builder and developer Spyro Dimitrakopoulos, president and CEO of Tega Homes. He has been building luxury homes and condos in Ottawa for over eight years and is currently working on his first highrise condo project, a development called Rhombus Tower at 111 Parkdale Ave. There is absolutely no question that Dimitrakopoulos is a forward-thinking and inspiring individual whose enthusiasm for his new rhombus-shaped building is infectious. (A rhombus is a four-sided parallelogram with no right angle — diamond-shaped for the non-geometrically inclined.) 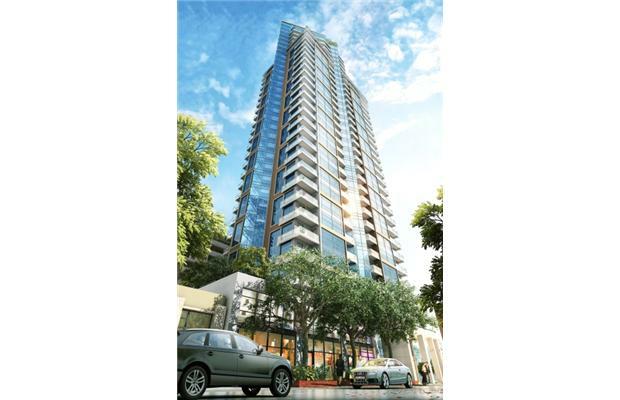 Read on to learn all about this fabulous, full-service, luxury condominium. Marilyn Wilson: What inspired a rhombus-shaped building? Spyro Dimitrakopoulos: I think Ottawa needs more than just traditional highrise blocks. We need to consider the skyline of the city and make sure we add something that is esthetically pleasing and unique, with interesting architecture. 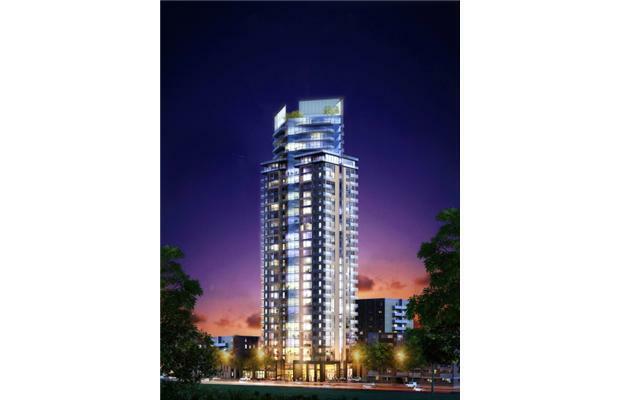 MW: Why will this will be the most luxurious condominium project in Ottawa? SD: I believe that condominium purchasers are much more educated these days, and the word “luxury” is pretty empty unless you have the specifications to back that up. To give you a short answer to this question, what separates us from other developers are: standard 10-foot ceilings, eight-foot doors inside every suite, European integrated appliances and an advanced home control system with an iPad in every unit. As far as building amenities are concerned, we have decided to build the three Skyclub levels on the premium penthouse floors. We will also have a concierge service that will be responsible for booking our many services, including valet dry-cleaning, massage and yoga, personal training and reservations for our virtual golf course, theatre room, lounge spaces and visitor suites. MW: I love that you are bringing the intelligent condo to Ottawa, in part by incorporating iPads into every unit. How will this feature contribute to the owners’ condo experiences? SD: All of the Rhombus units will leverage advanced home control system technology. This built-in intelligence will enable residents to manipulate heating, cooling, lighting, blinds, music, security and many other features, whether they are home or not. Each unit will come with its own iPad to control these features, and the software will be available for residents to download onto their iPhones, Blackberries or any other android devices. MW: How long has Rhombus been in the planning stages and when is your launch scheduled? SD: Honestly, this has been in the planning stages ever since I started in the building business. A project of this magnitude has been my goal for many years, but I have been waiting for the right location. The specific planning for Rhombus started about two years ago when I secured that location. We will begin sales in the next few weeks. MW: You said that you’ve been waiting for the right location. What makes this the right location? SD: First of all, it is a gorgeous area, just a two-minute walk down to the Ottawa River and the bike paths. It gives the most amazing views of the city both east and west. Also, it is located minutes away from some of the most desirable areas in the city (Wellington Village and Westboro) and surrounded by some of the most popular restaurants, theatres and boutiques. And most importantly, it is just steps away from the hub of Ottawa’s new transportation system, which will connect with downtown, to shopping centres, government buildings and private employment centres. Rhombus is also located directly across the street from Tunney’s Pasture, which is expected to double in capacity over the next 10 years. MW: I’m sure our readers will be happy to hear that. It’s nice to know that you took into consideration two major aspects of people’s lives: work and play. It’s also great to hear that you managed to incorporate 10-foot ceilings into the design, as many prospective condo buyers worry about feeling cramped in a condo after living in a single-family residence. Will the ceiling height make this the highest building in the area? SD: Yes, I do believe so. You have to remember that each unit has standard 10-foot ceilings. We could have added two extra floors of residences with the same building height, but we wanted to create a different experience of living, with high ceilings and floor-to-ceiling windows. MW: Tell me, what will residents see out of these windows? How does the shape of your building optimize the views? SD: As far as the individual residences are concerned, I’ve designed the building to have curtain walls, giving unobstructed views. It is this rhombus architectural detail that will give our clients a panoramic vantage point that would otherwise be impossible to experience. MW: Does the shape of the building also influence the layout of the individual units? SD: The shape gives many dramatic contours, especially on the penthouse levels. MW: Your three-floor, 16,000-square-foot Skyclub offers residents and their guests fantastic amenities. I love that you will have a 70-foot pool with cabanas. Would you please elaborate on other features? SD: We have researched the best boutique hotels in the world and have decided on amenities that will best suit the needs of our clients. In addition to the pool, we have premium aerobic and weight training equipment, yoga and massage rooms, a golf simulator, a theatre room, lounge facilities and kitchens for large or small events, as well as our outdoor 33rd-level rooftop Skyclub for al fresco events. All of these services can be booked through the concierge. We have been selective in choosing amenities we know the residents will use so as not to burden the owners with maintaining unwanted services. MW: How are these resources going to affect condo fees? SD: It is actually going to have a positive effect on the condo fees. There are other buildings with exercise facilities and swimming pools. We have decided to make an initial capital investment by sacrificing premium penthouse level space for these services instead of putting them on lower-ground or basement levels. That way the cost is absorbed in the price and doesn’t affect the condo fees. Concierge service is an efficient and convenient way to cater to the needs of our residents and their guests. And by offering private, pay-per-use services that will be in demand by many of our residents, the condominium community will benefit from having these facilities in the building. For example, booking a massage, yoga lesson, private training session or a guest suite will garner revenue for both the service provider and the condominium corporation. Other services like the dry-cleaning valet will be offered at no cost to residents. We have researched revenue models from a number of boutique hotels and condominiums in large cities and have chosen both standard and private services that will benefit residents and actually be used. MW: It sounds like you did your due diligence. This is an interesting model. How much do the units run? SD: From just under $200,000 to $3 million for some of the combination units. MW: Tell me about the 3,700-square-foot penthouse all on one level and with an elevator opening directly to the unit. SD: This is actually a custom unit on the 32nd floor. If there is a demand for this type of unit it can also be repeated on levels 28 to 31, our other penthouse levels. MW: How many elevators will the building have? SD: There will be three high-speed elevators with private access to penthouse levels. MW: What is the smallest condo? The largest? SD: We do have just a few smaller studio units in the 300-square-foot range. The largest can be up to 1,650 square feet between floors 3 and 25. And, as we discussed earlier, it is possible to purchase up to a 3,700-square-foot unit. MW: You are offering sweeping, covered balconies. Please elaborate on this. SD: Yes, on the penthouse levels we do have large balconies. Some of them are as wide as seven feet. Units on floors 3 to 25, especially the combined units, can have as many as three balconies and the units themselves as much as 80 feet of exterior glass and frontage. MW: What do you mean by combined units? SD: This is another unique feature of the Rhombus Tower. Listening to the demands of our clients, we have decided to offer combined units from the 3rd to the 25th levels with unique floor plans that create spacious residences with two or three bedrooms, large living and dining areas, at least two full bathrooms and up to three balconies. These units come in a number of square footages ranging from 950 up to 1,650 depending on the needs of our clients. MW: I very much enjoyed this sneak peek into Tega Homes’ upcoming Rhombus Tower and want to thank Spyro Dimitrakopoulos for giving Condo Scene readers a glimpse into the future. Marilyn Wilson has been selling real estate for more than 23 years and owns Marilyn Wilson Dream Properties Inc. Brokerage in Ottawa, an Exclusive Affiliate of Christie’s International Real Estate. She can be reached through dreamproperties.com or follow her on Twitter@marilyn_wilson.